The hike will start at Gubeikou, a relatively unvisited part of the Great Wall that is in its natural and unrestored state. After a few hours of hiking we'll pass over into Jinshanling, where restored brickwork, and large watchtowers dot the land. The next day we'll continue the hike at Panlongshan, a strategic point on the Great Wall that is a bit of a challenge due to its steepness and condition. Our next hike will be at Xiangshuihu, which is set against a backdrop of lush forestry. 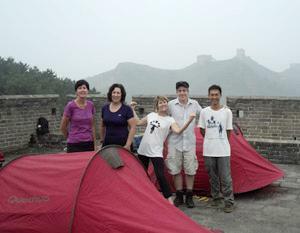 We'll soon cross over onto the Jiankou Great Wall, which features dramatic peaks and ruins. The next day we'll resume the hike on Jiankou, and after a few hours we'll come to Mutianyu, one of the most famous and popular sections of Great Wall, but one which has escaped the tackiness of other popular Great Wall spots. The next day, we'll hike at Huanghuacheng, which is fast becoming popular with hikers. About halfway through the hike we'll pass over into Xishuiyu, and as we walk along the ruins of the wall here, you will get to see something truly special, the broken Great Wall running underwater.